Edward Tyldesley 1679-1725 was the eldest son of Thomas Tyldesley 1657-1715, the Diarist. Thomas Tyldesley had died early in 1715, after having his sword and gun repaired in preparation for the anticipated uprising. However, like his father, Edward Tyldesley was a fervent Jacobite. When the uprising occurred Edward Tyldesley led a troop of men into Preston with his sword drawn. At the cross in the market place the Chevalier de St George was proclaimed to be James III (and VIII of Scotland) . 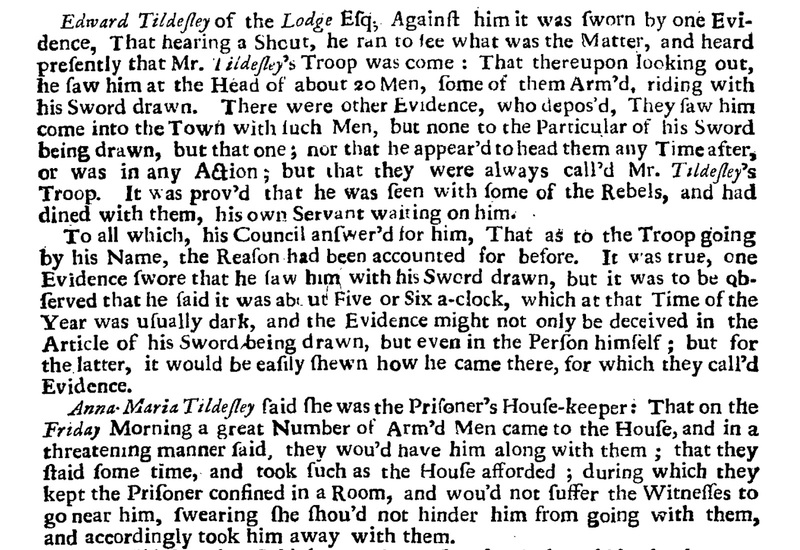 Edward Tildefley of the Lodge Esq; Againft him it was fworn by one Evidence, That hearing a Shout, he ran to fee what was the Matter, and heard prefently that Mr. Tildefley's Troop was come : That thereupon looking out, he faw him at the Head of about 20 Men, fome of them Arm'd, riding with his Sword drawn. There were other Evidence, who depos'd, They faw him come into the Town with fuch Men, but none to the Particular of his Sword being drawn, but that one; nor that he appear'd to head them any Time after, or was in any Action; but that they were always call'd Mr. Tildefley's Troop. It was prov'd that he was feen with fome of the Rebels, and had dined with them, his own Servant waiting on him. To all which, his Council anfwer'd for him, That as to the Troop going by his Name, the Reafon had been accounted for before. It was true, one Evidence fwore that he faw him with his Sword drawn, but it was to be obferved that he faid it was about Five or Six a-clock, which at that Time of the Year was ufually dark, and the Evidence might not only be deceived in the Article of his Sword being drawn, but even in the Perfon himfelf; but for the latter, it would be eafily fhewn how he came there, for which they call'd Evidence. Anna-Maria Tildefley [FN2] faid fhe was the Prifoner's Houfe-keeper: That on the Friday Morning a great Number of Arm'd Men came to the Houfe, and in a threatening manner faid, they wou'd have him along with them ; that they ftaid fome time, and took fuch as the Houfe afforded ; during which they kept the Prifoner confined in a Room, and wou'd not fuffer the Witneffes to go near him, fwearing fhe fhou'd not hinder him from going with them, and accordingly took him away with them. Mrs. Tildefley, who, I think, was the Prifoner's Mother [FN3], faid, that he came on the Night aforefaid, and fhe having no Lodging, fhe fent to an Inn to procure him one, and that he exprefs'd himfelf diffatisfied at his being brought thither. This was confirmed by one Parkinfon, who kept the Inn; and faid farther, That the Prifoner and he talk'd of fome Law Affair, and not of anything relating to the Rebellion : But being ask'd where the Prifoner lay the next Night, he faid, he did not know. Anna-Maria Tildefley being ask'd by the Prifoner's Councel, if fhe had not heard that he attempted to make his Efcape? She faid yes; and among other ways it was once agreed that he fhou'd go away in Womans Cloaths, and accordingly a Relation of theirs, who was a pretty Bulky Woman, and of his Size, was actually undreffing , but this was unrefolv'd on again. He call'd another Witnefs, who fwore that the Prifoner would have hired a Horfe of him on Saturday Morning; and being ask'd if the Prifoner told him where he was to go ? He faid, he told him he was to go Home to his own Houfe, for his own Horfes were known, and that he exprefs'd himfelf to this Evidence very much concern'd at his being there. But it was ftrictly examin'd into whether this was not after they heard the King's Forces were coming up? For no doubt, as it was obferv'd, they would many, or all of them, have been glad of any means of efcaping the Danger that threatned them, when they began to fee they had made a falfe Conjecture of the ftrength of the Rebels, and the vigilance and activity of the King's Troops. The Prifoner call'd Sir George Warburton and fome other Gentlemen to his Reputation, who faid, they never heard him fpeak with difrefpect of the Government; but faid he was a facetious inoffenfive Man. Upon the whole, it appears that the Jury Credited the Plea, That he was brought by Violence, and kept by Conftraint: for he was likewife acquitted. 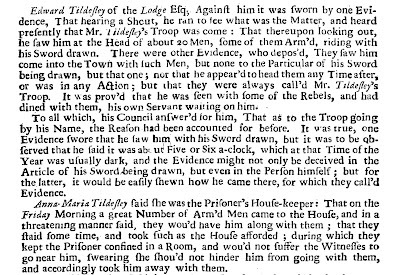 Edward Tyldesley of the Lodge, a Papist, Lancashire, was acquitted by the Jury at the Marshalsea, tho' it was proved he had a Troop and entered Preston at the Head of eight with his Sword drawn. But his Sword had a Silver Handle. However, read in context this seems more likely to be a sly reference to the fact that the jury were widely believed to have been bribed!